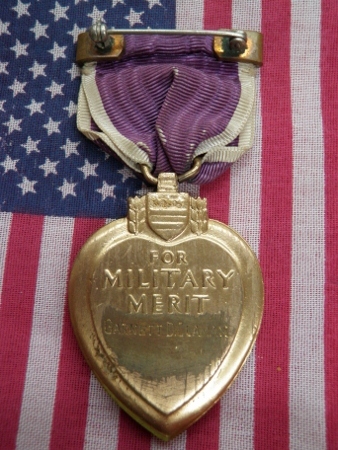 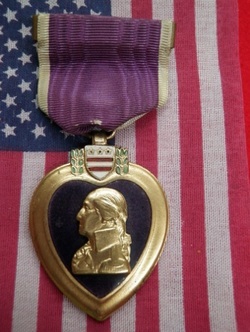 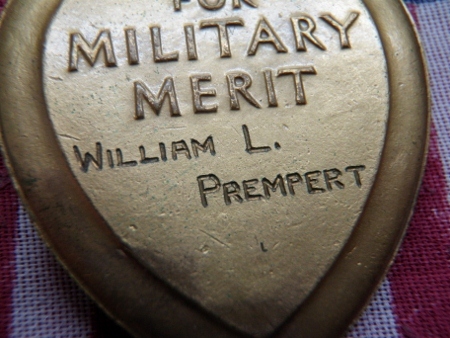 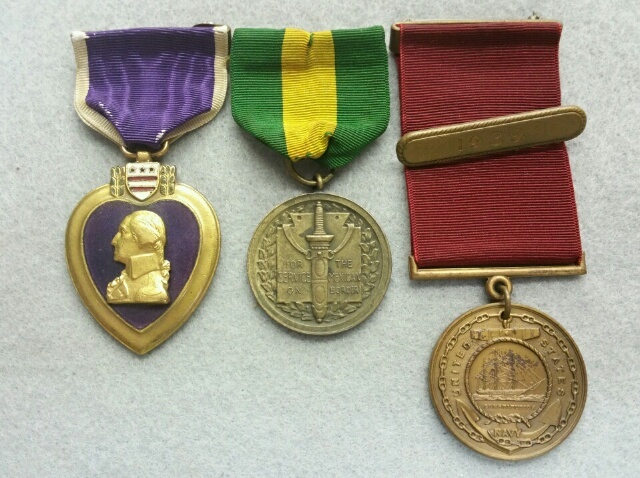 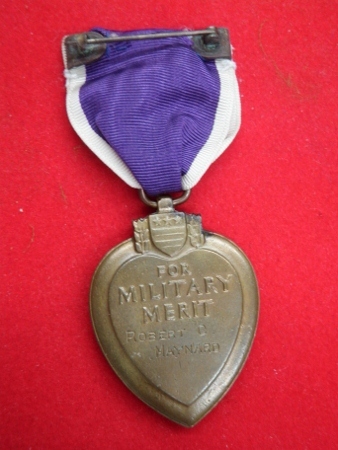 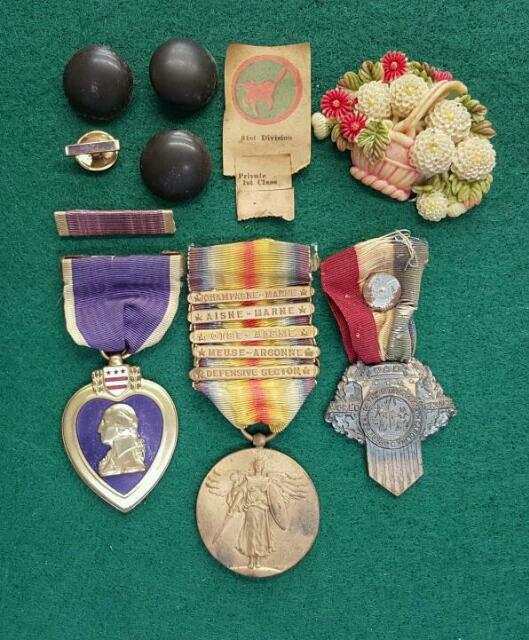 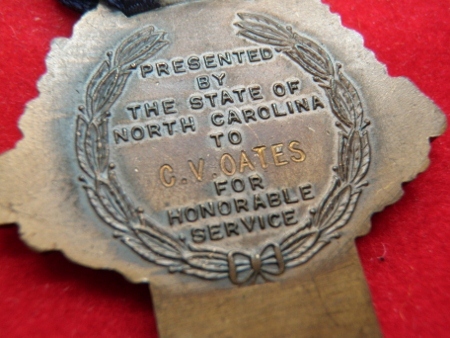 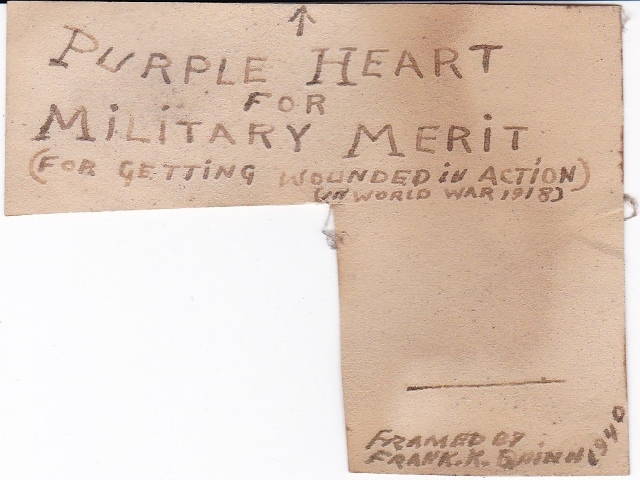 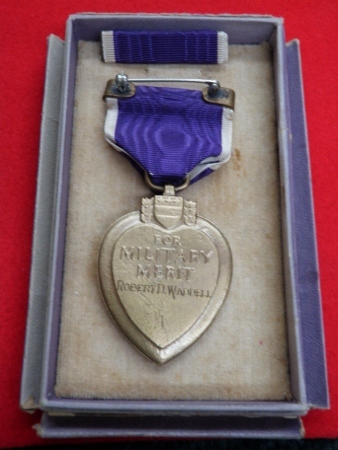 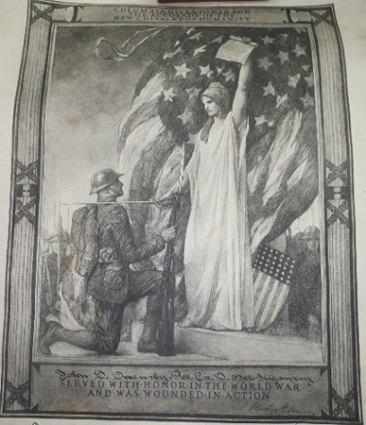 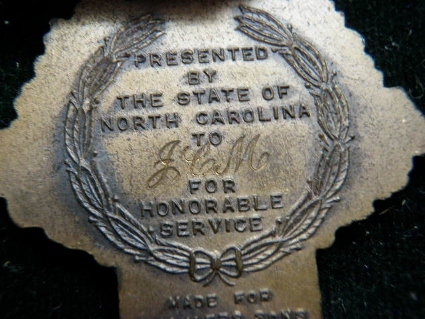 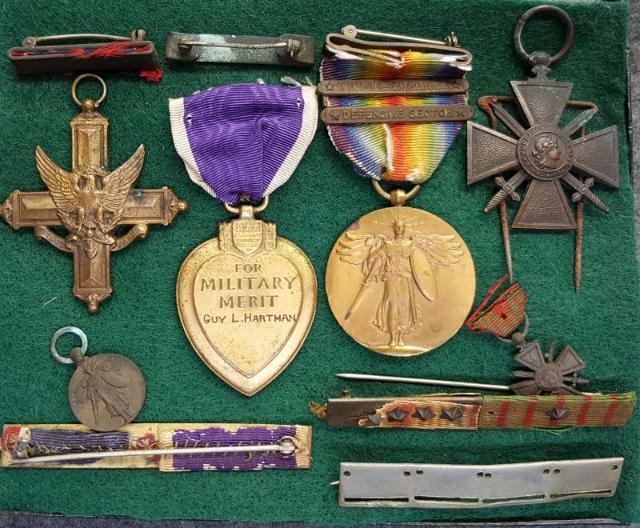 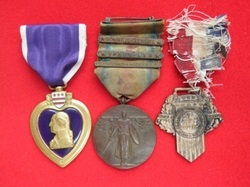 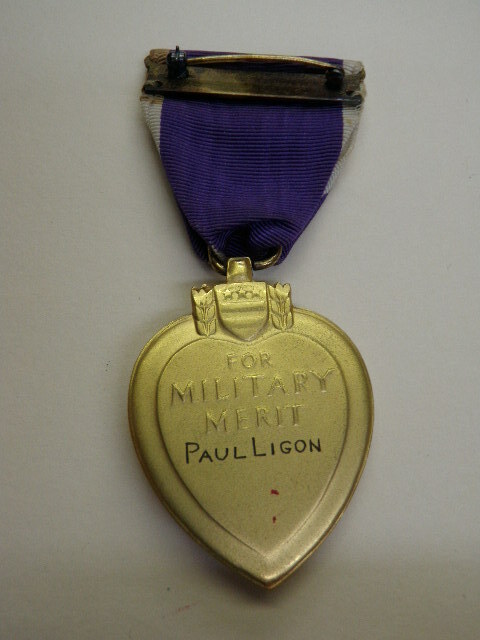 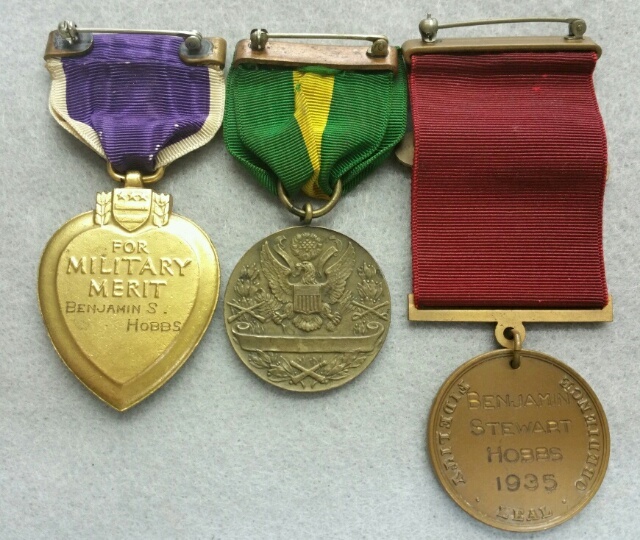 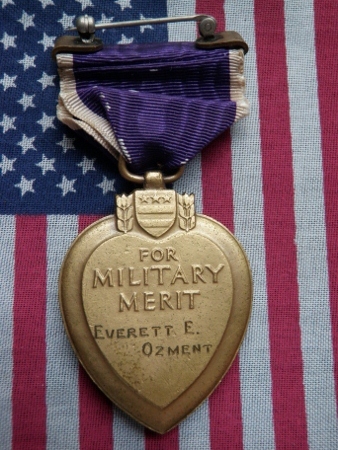 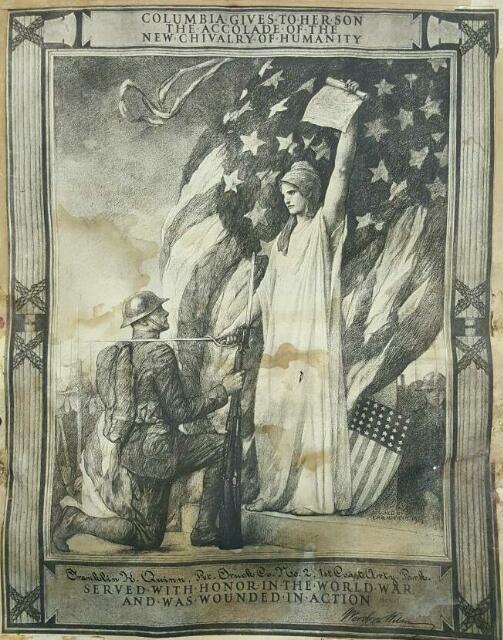 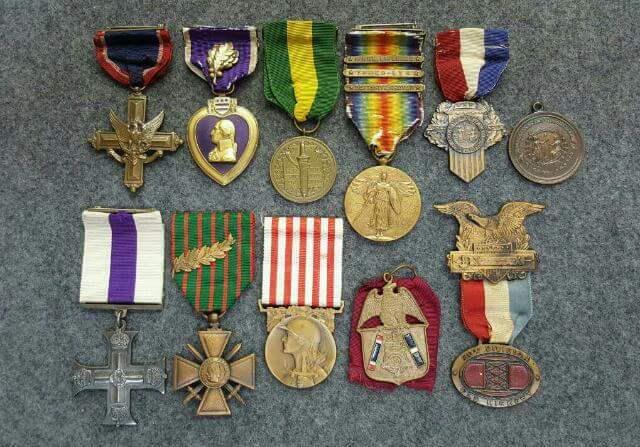 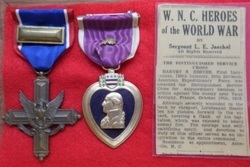 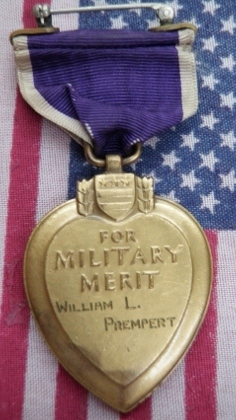 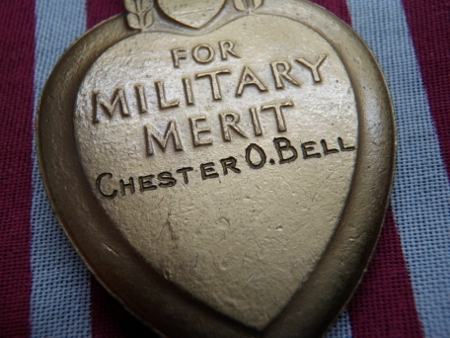 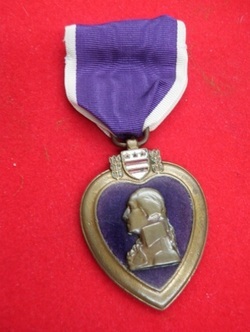 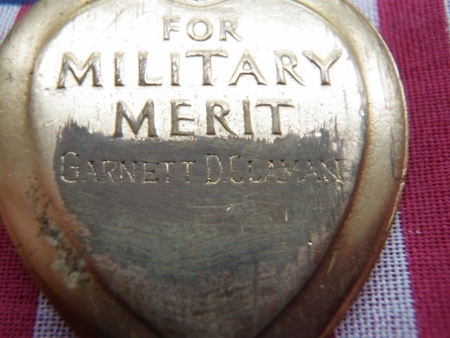 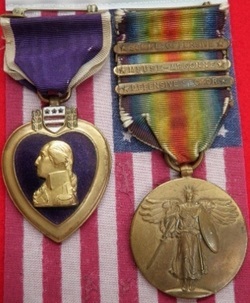 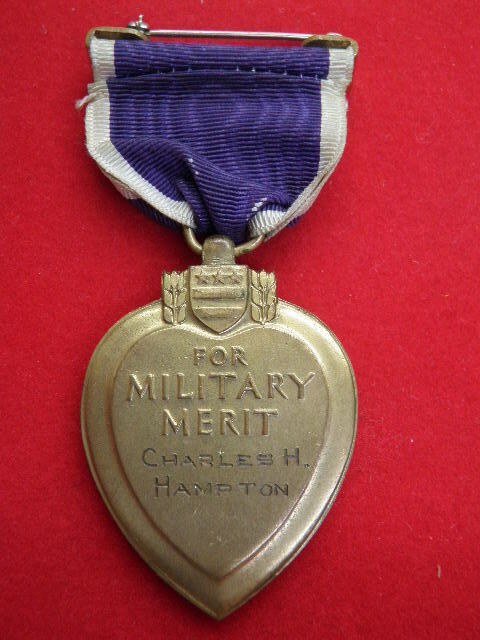 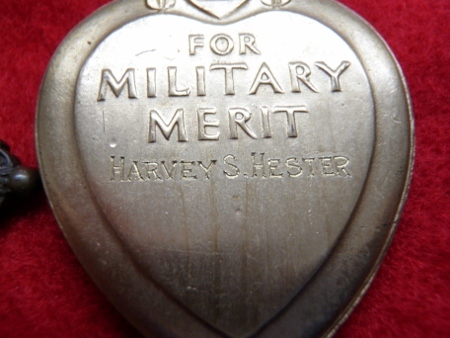 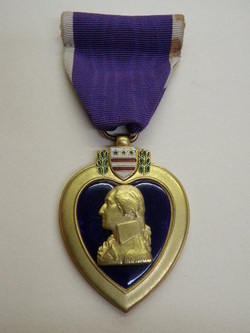 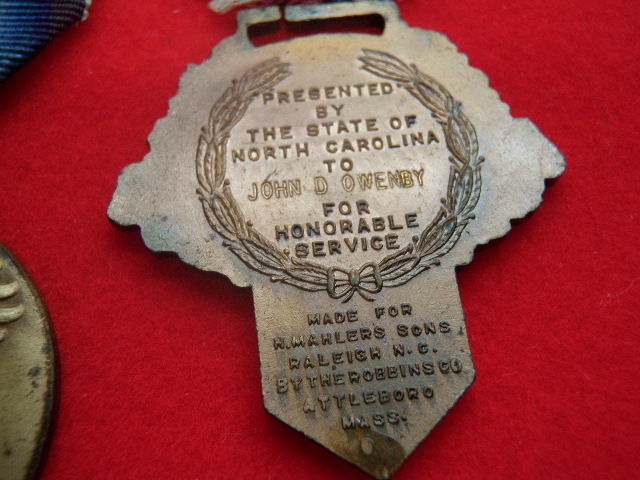 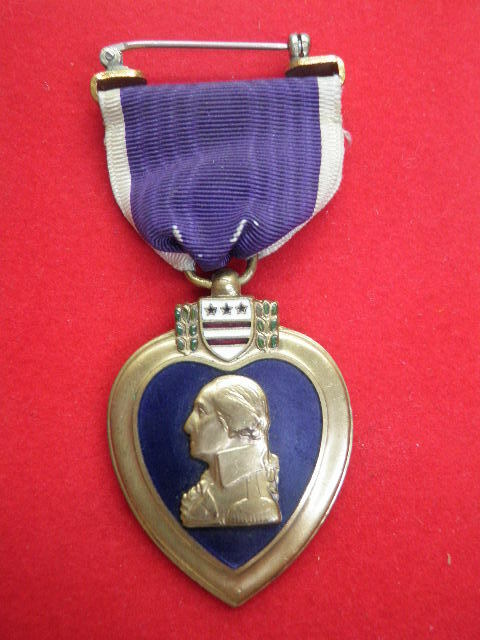 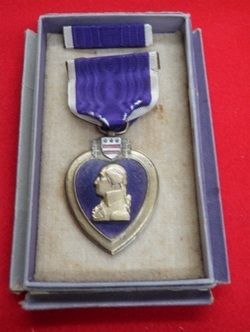 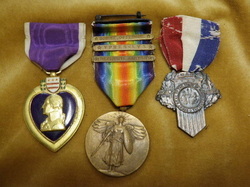 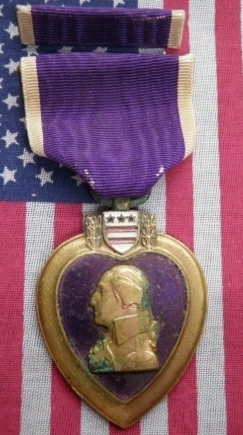 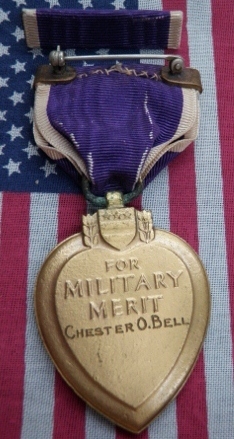 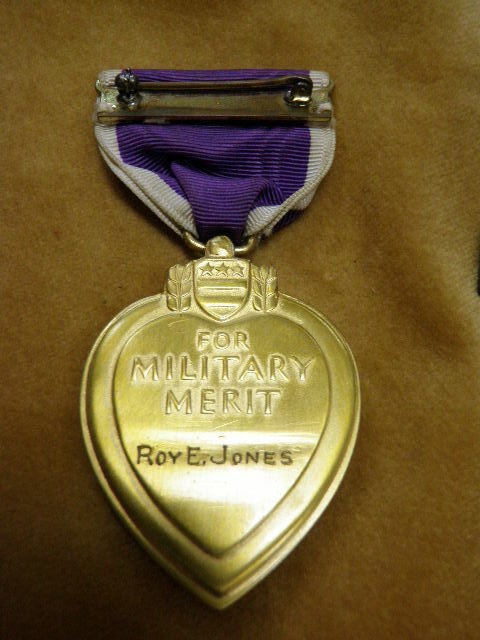 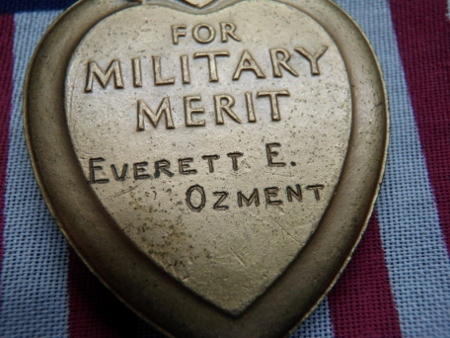 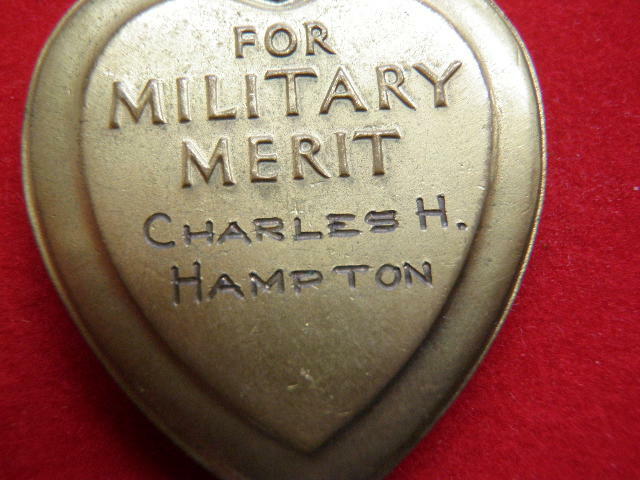 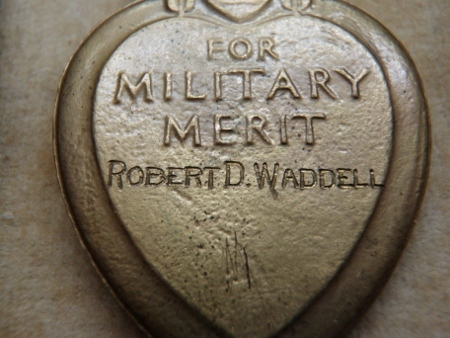 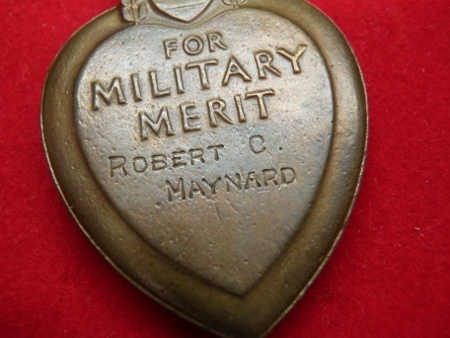 WWI - PURPLE HEART AND MEDAL RECIPIENTS FROM NORTH CAROLINA & MORE "IF YE BREAK FAITH WITH US WHO DIE, WE SHALL NOT SLEEP"
The Purple Heart was first awarded in 1932.The Veteran had to apply for his medal, There was no Posthumous award for a Purple heart at this time. 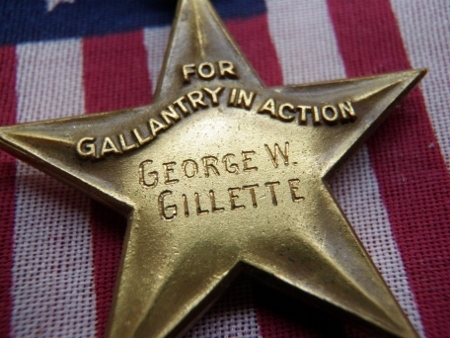 Before this Soldiers received The Presidential Wound Certificate and Killed in Action Certificate commonly known as "Accolades". 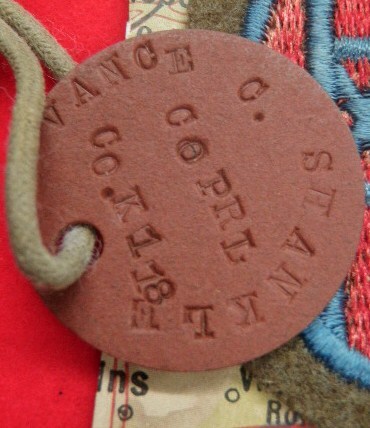 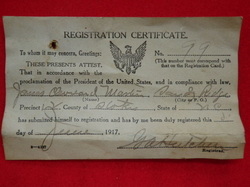 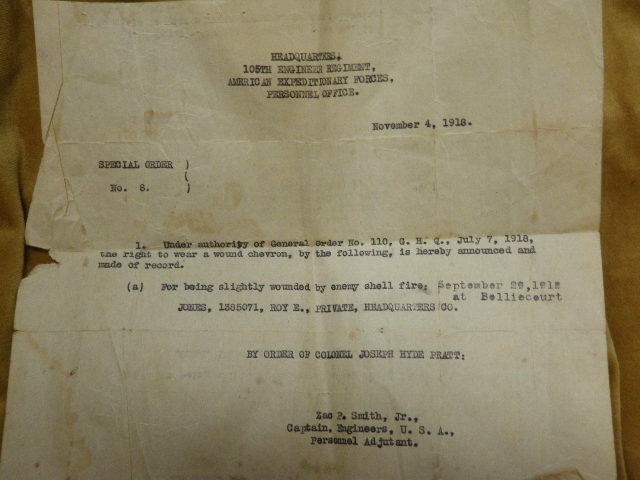 This is The Presidential Wound Certificate or "Accolade"
Headquarters Co.,105th Engineers 30th Div. 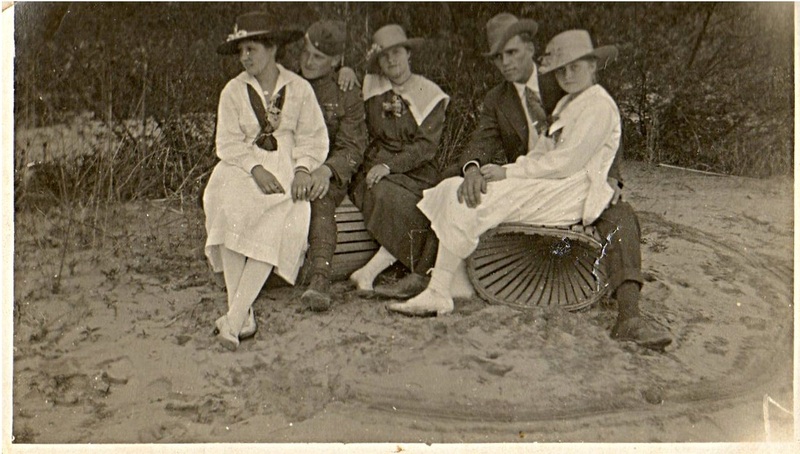 Roy Jones and future Bride on your right. 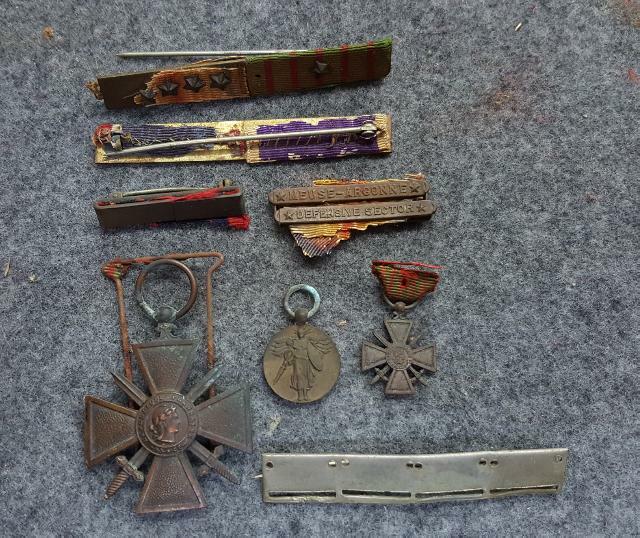 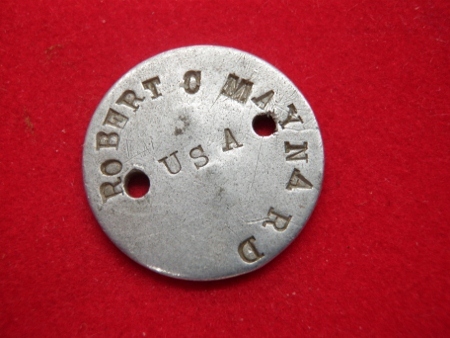 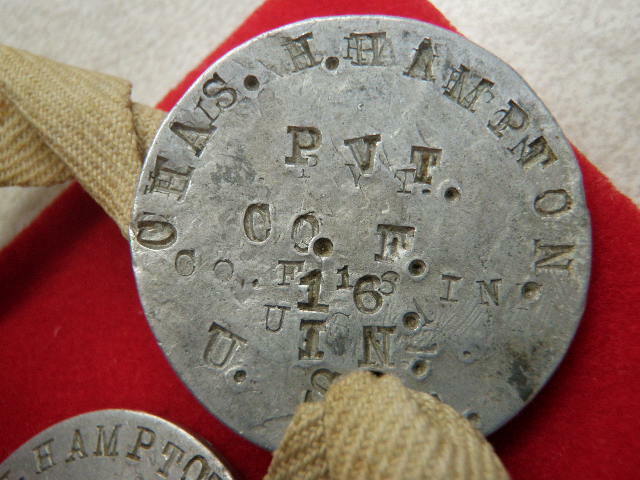 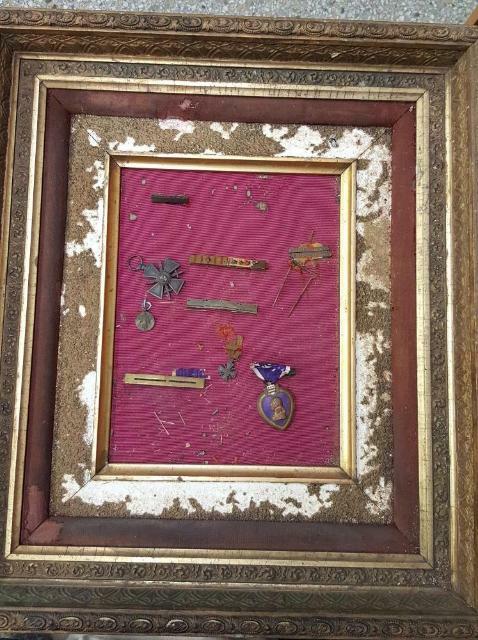 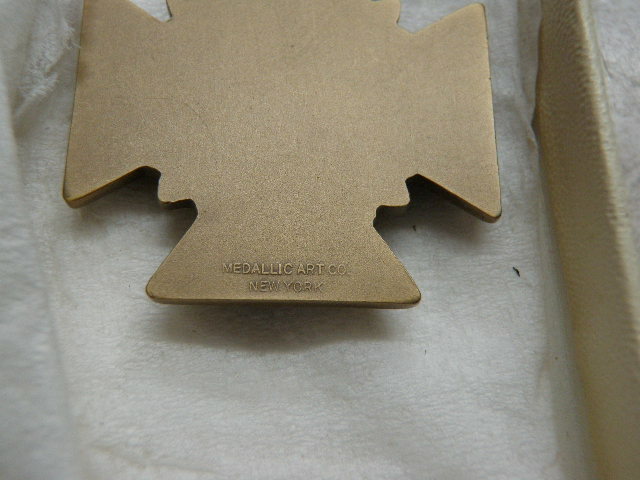 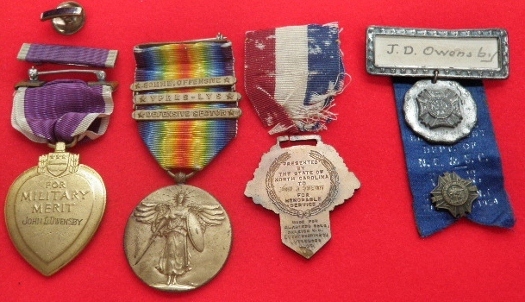 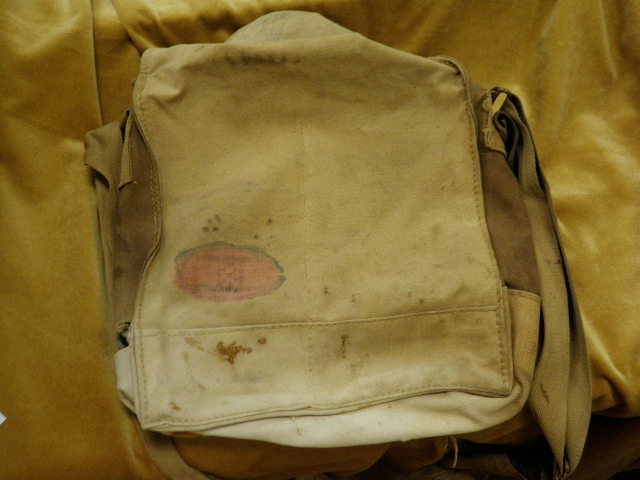 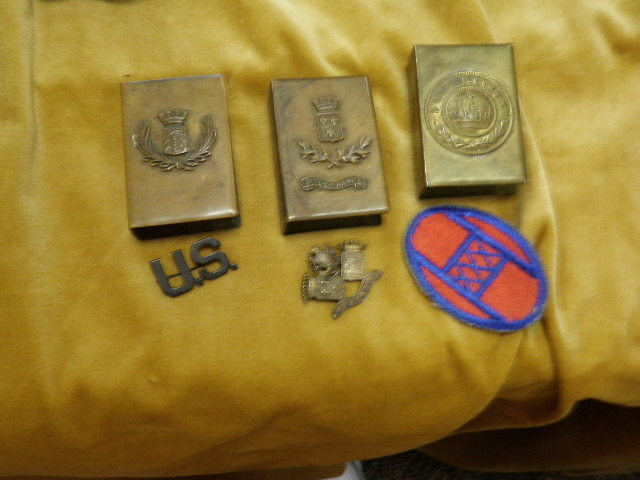 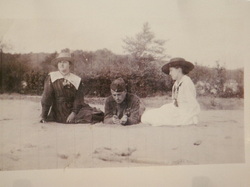 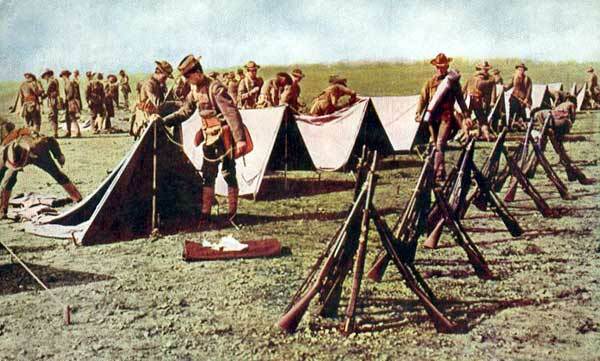 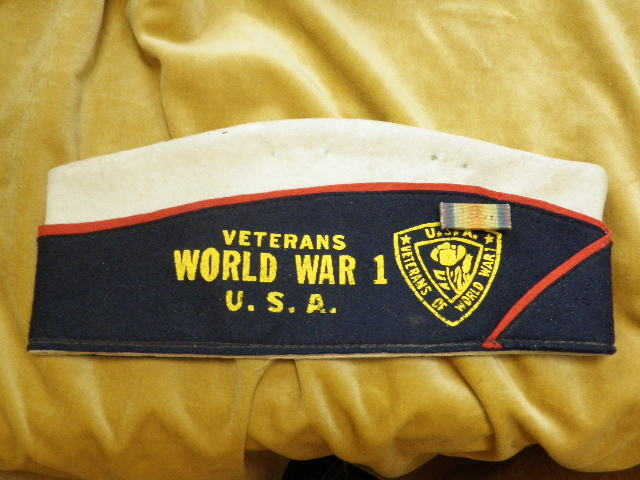 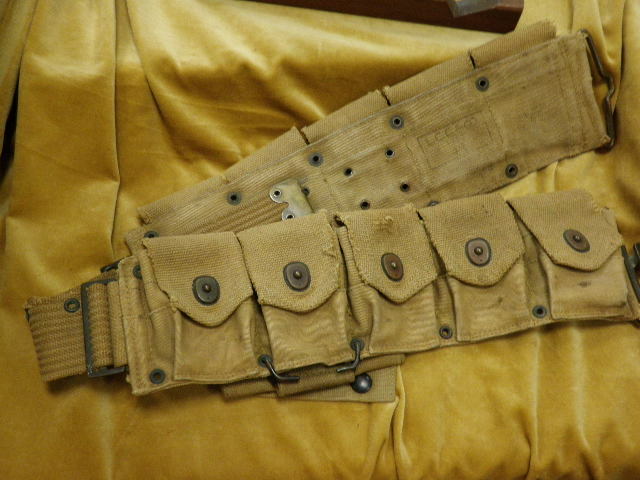 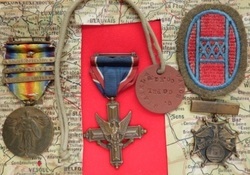 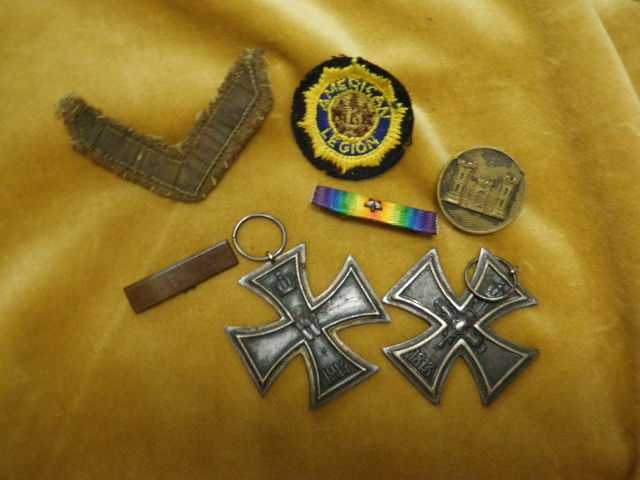 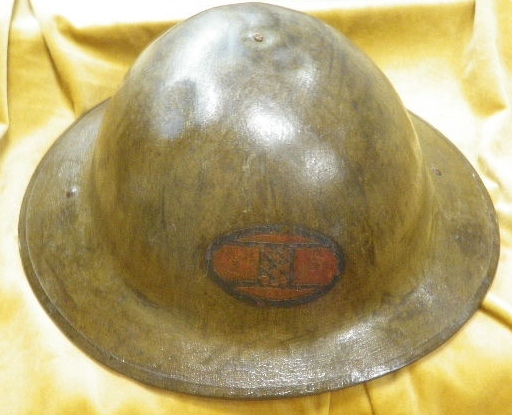 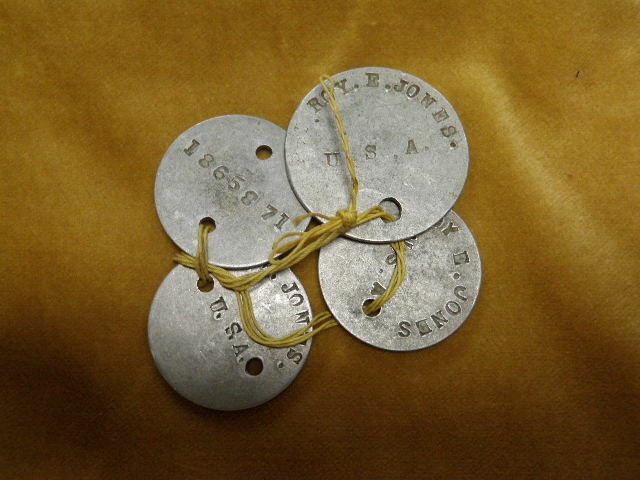 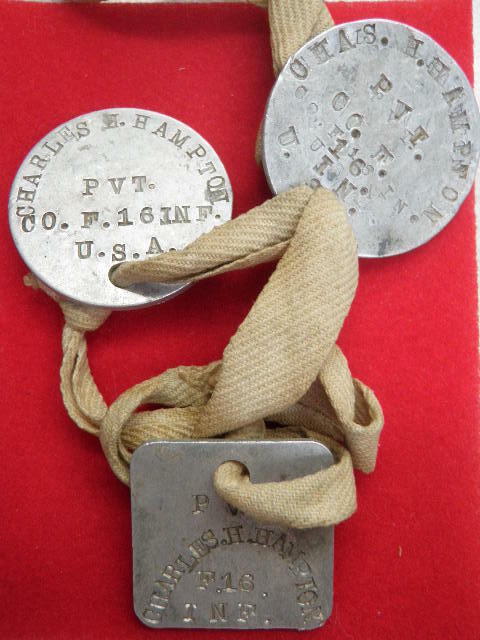 The items below include some of Pvt.Jones gear used in WWI.There are also some souvenirs that were picked up overseas. 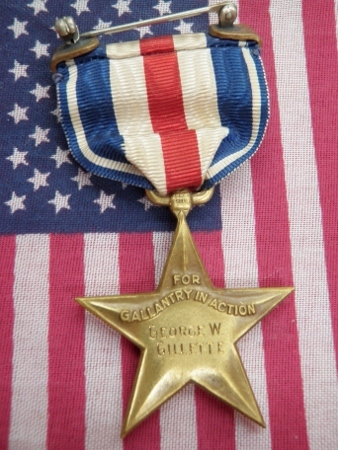 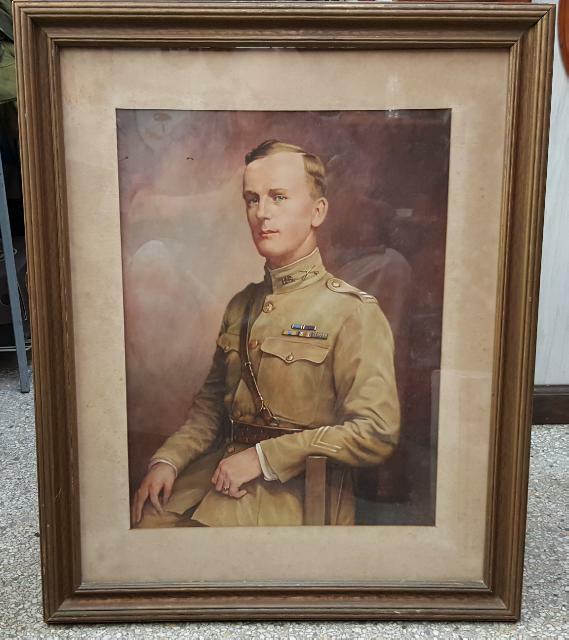 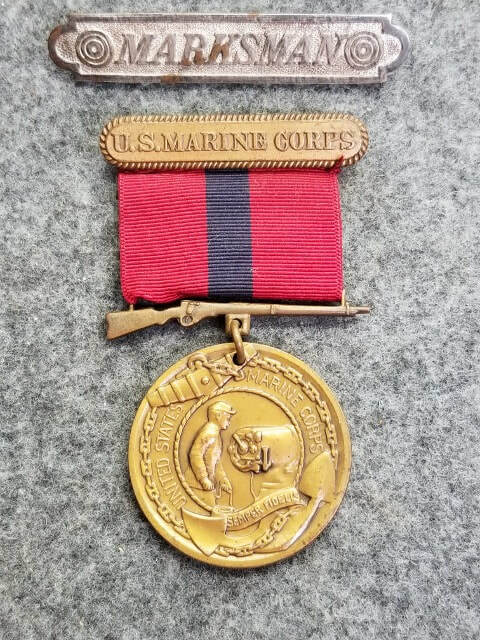 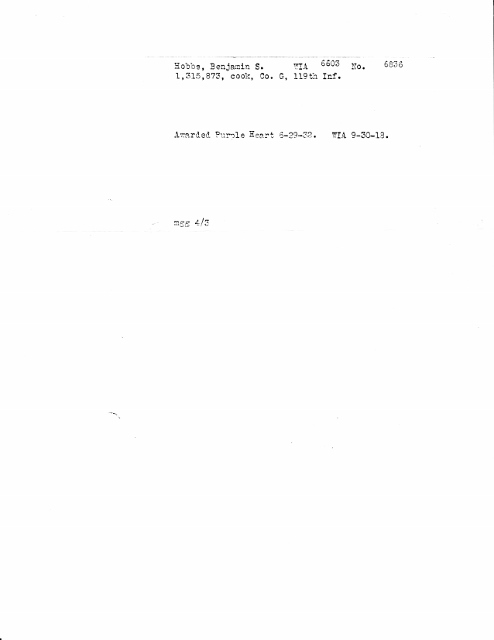 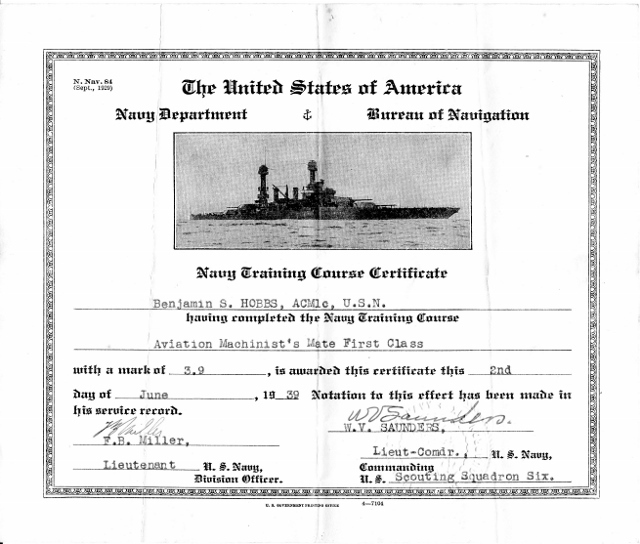 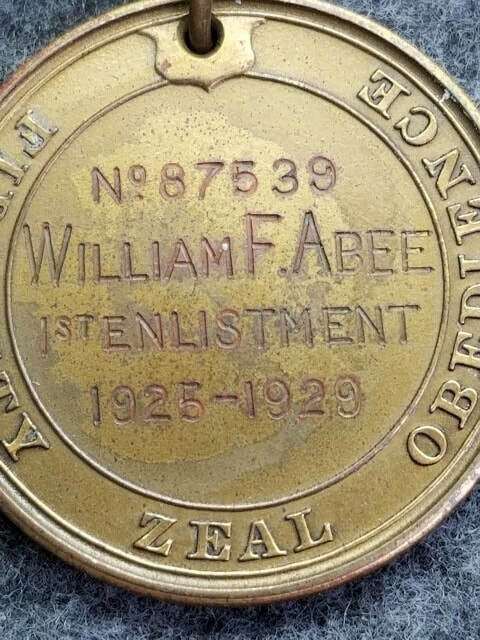 Cited in Sec.2 Par A of General Order 5 1st inf.brigade 1,June 1919 Citation for Gallantry in Action.He later served in the Navy on the USS Pennsylvania. 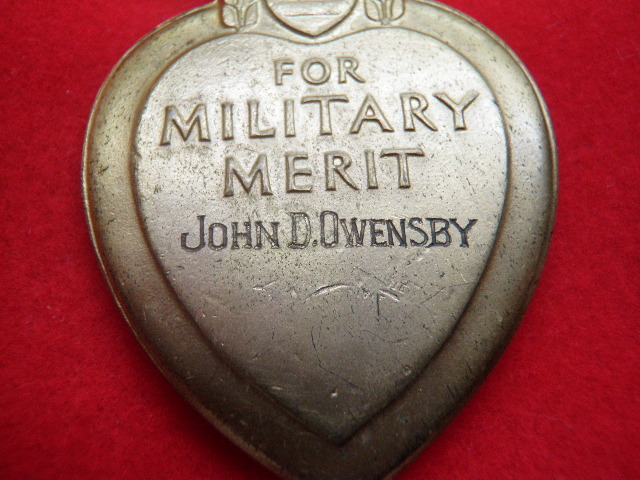 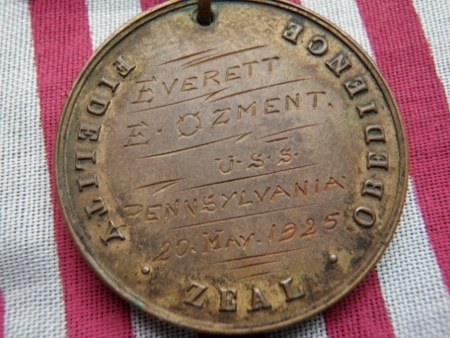 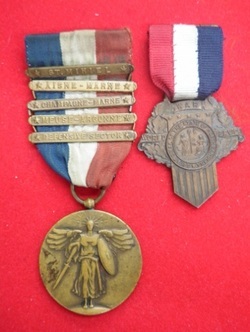 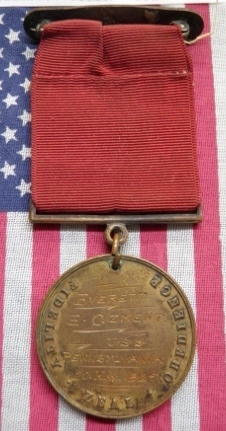 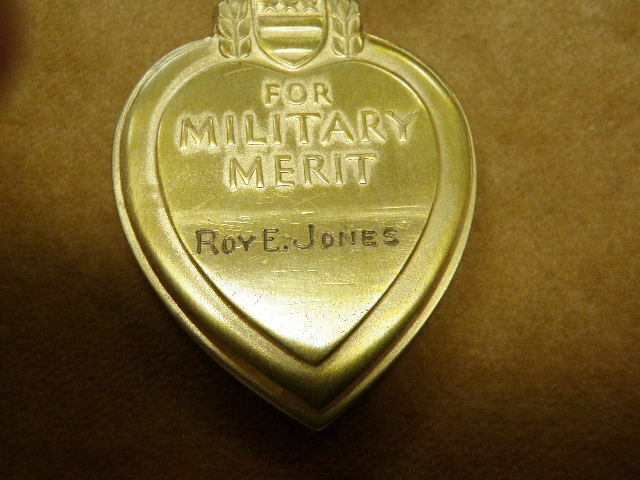 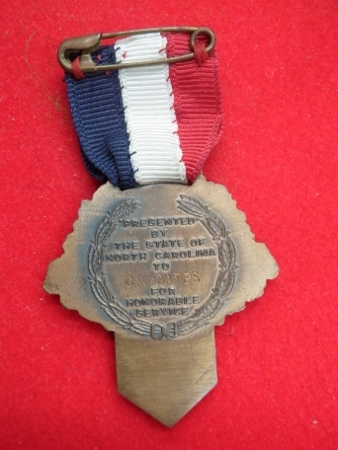 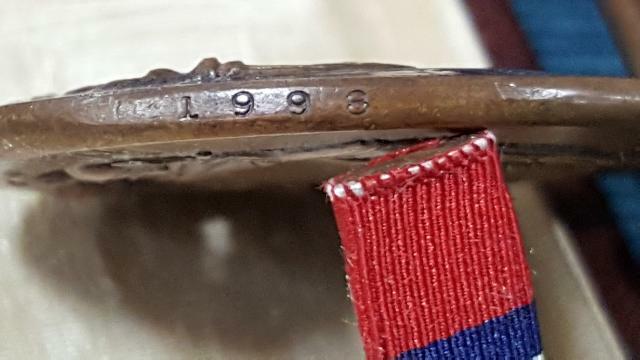 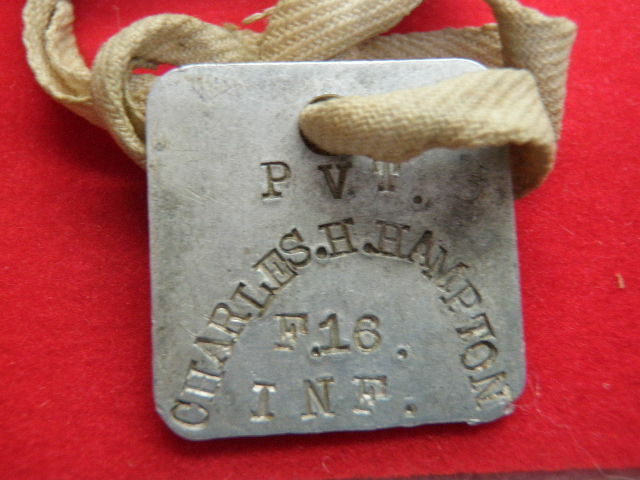 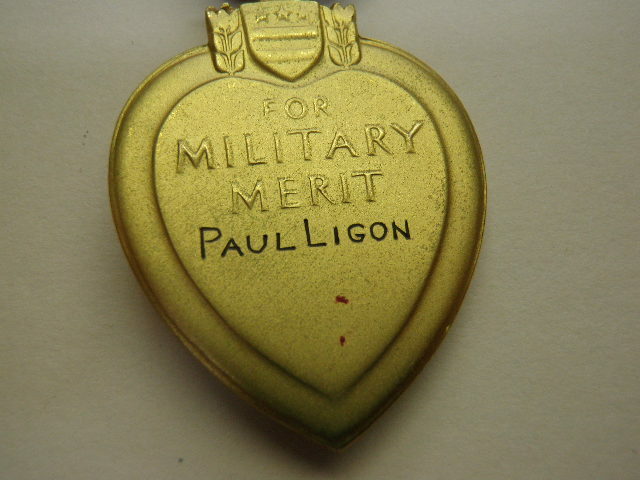 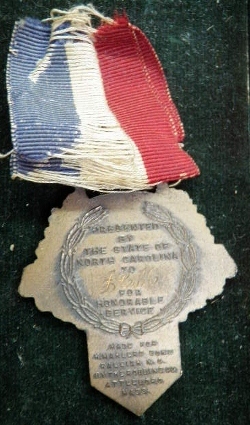 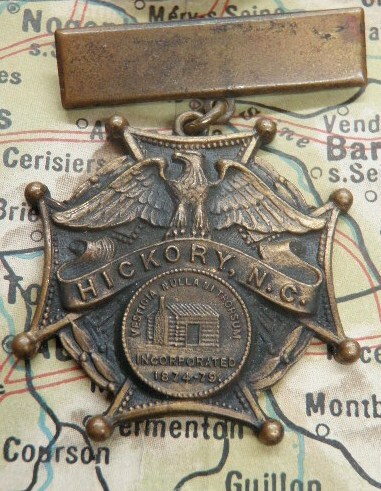 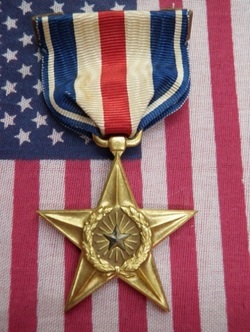 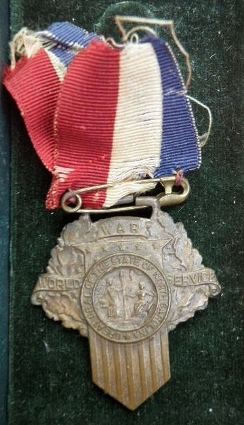 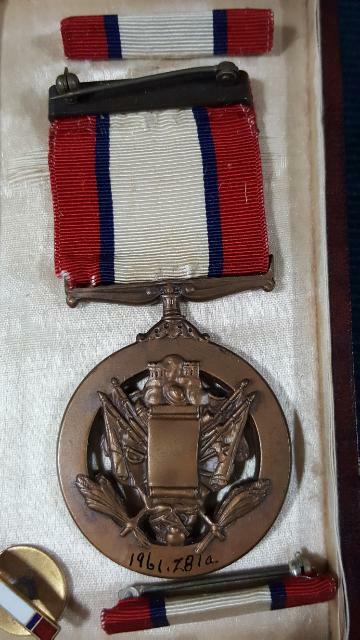 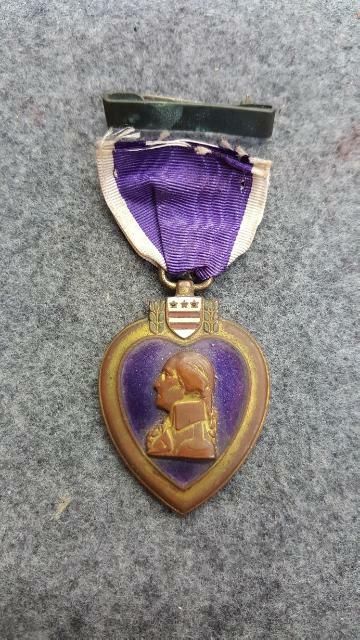 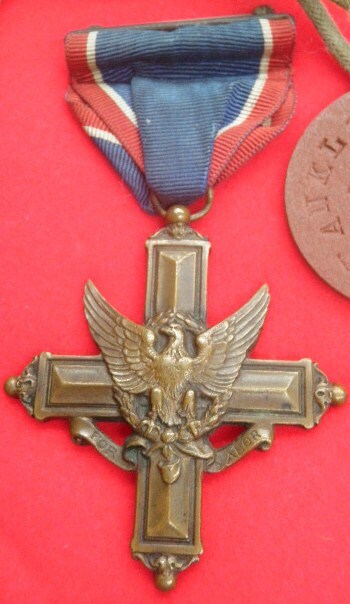 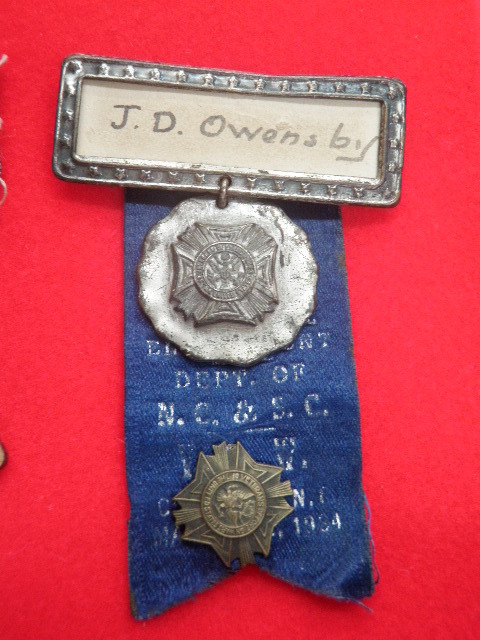 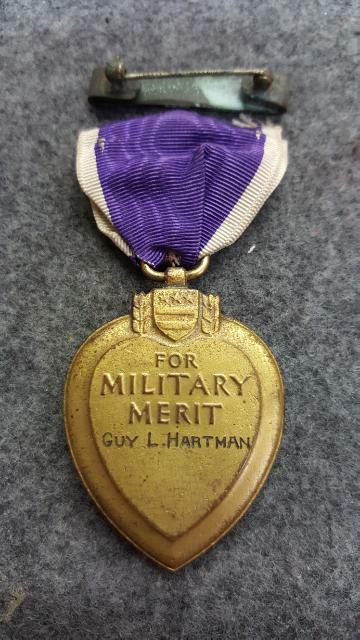 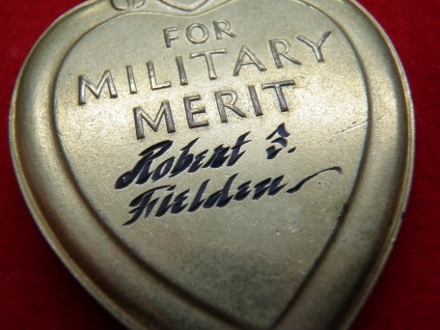 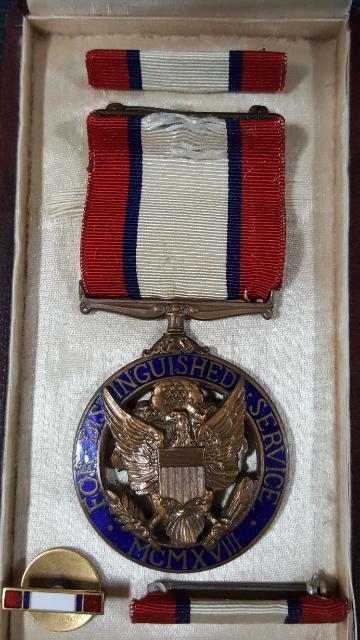 awarded for a casualty in WWI. 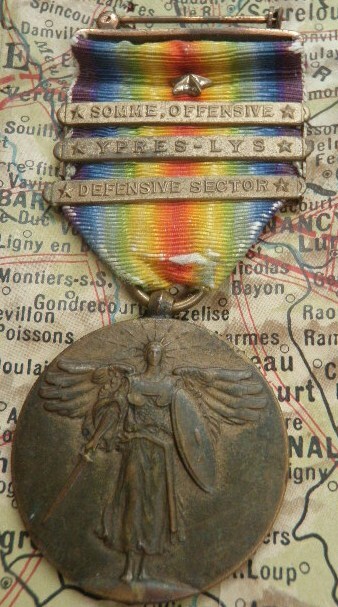 Wounded in Action: 18 July,1918 by shrapnel in back at Aisne-Marne. 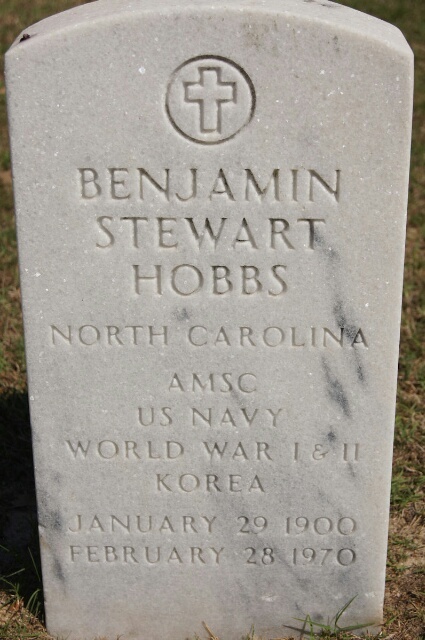 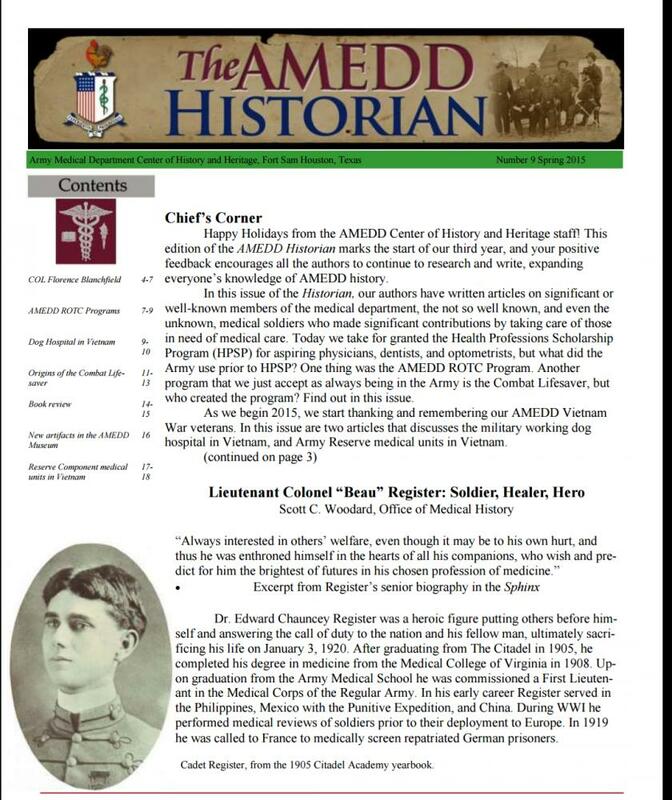 AMSC Benjamin Stewart Hobbs had a long Military career. 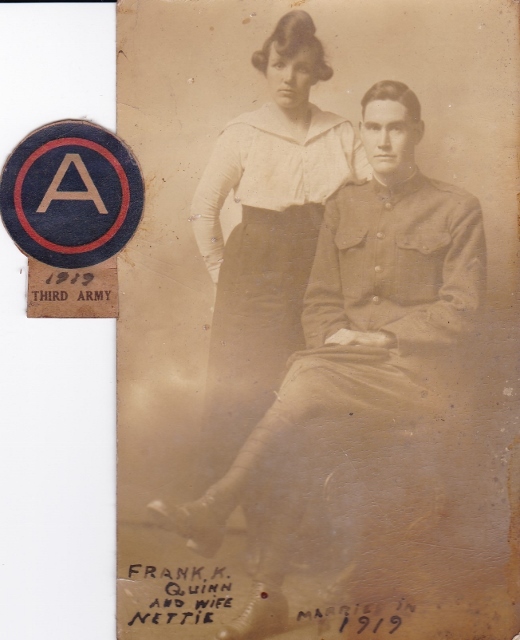 He was born 29 January 1900 in Fayetteville, NC and joined the Army on 9 September 1916 at Wilmington, NC. 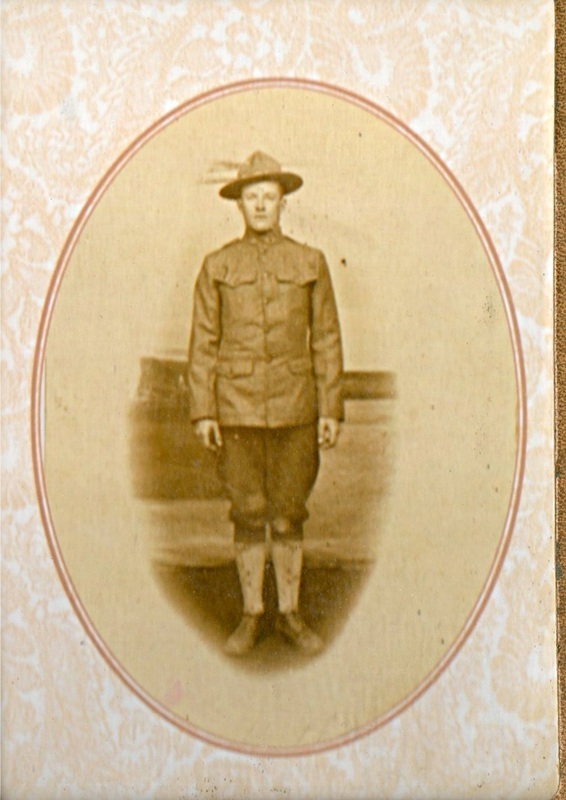 He was assigned to G Co 119th Infantry Regiment. 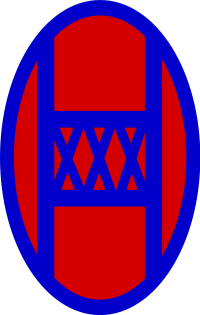 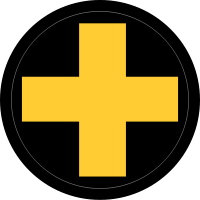 ..30th Division. 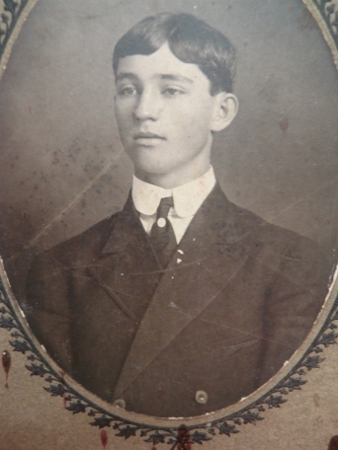 ..as a Cook.He served faithfully and was wounded in WWI on 30 September 1918. 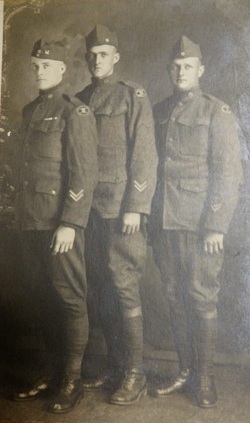 Cook Hobbs takes his leave of the Army on 8 December 1919.He was 19 years old. 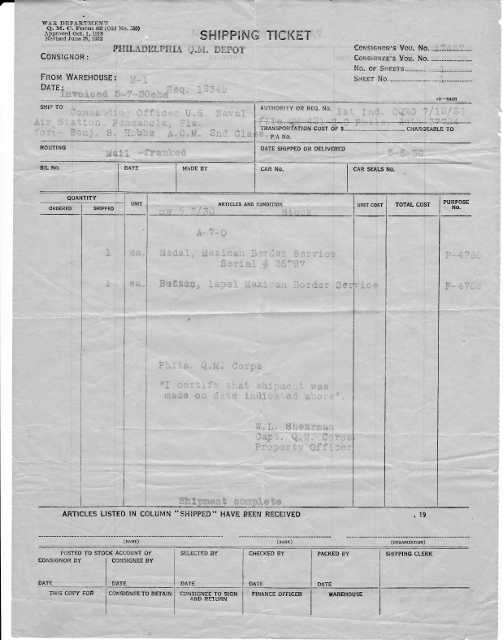 Sometime from that point of leaving the Army...Benjamin S Hobbs joined the Navy.The orginial document for the shipping of his Mexican Border Service medal serial # 35797 is included in this group.That document has a date of 6 May 1930... at that point, Hobbs was wearing the rank of a ACM2cl. 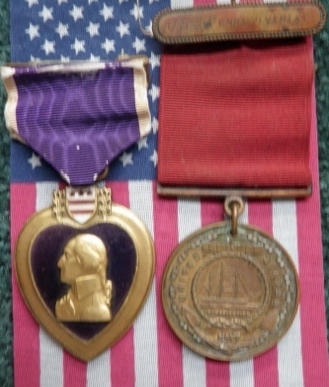 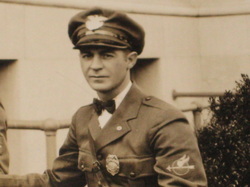 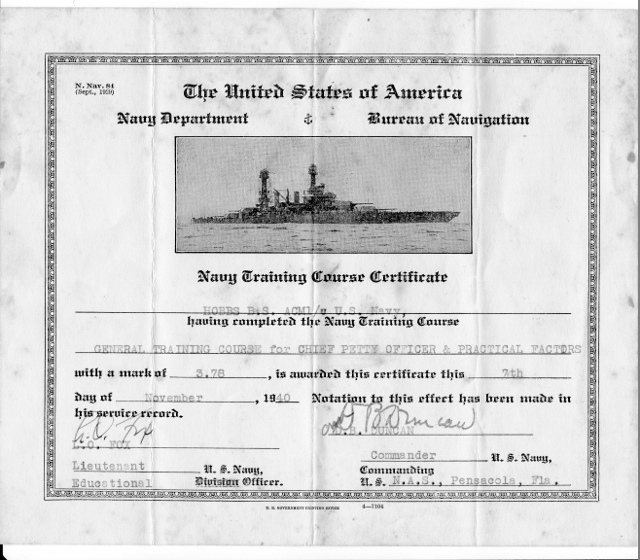 He remained in the Navy until his retirement April 1951.He survived WWI...WWII and Korea.I have not completed any research other than what has been posted...another day. 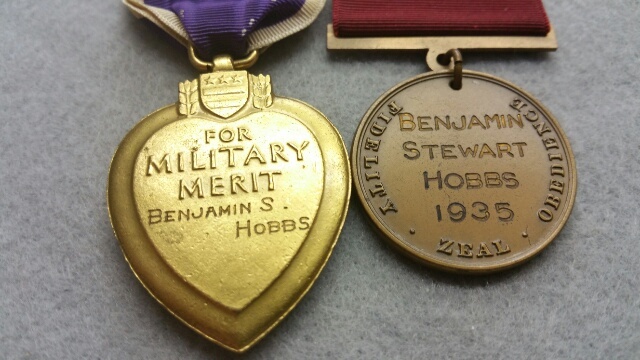 I am glad to see Benjamin S Hobbs lived to benefit from his years of service and to enjoy some retirement. 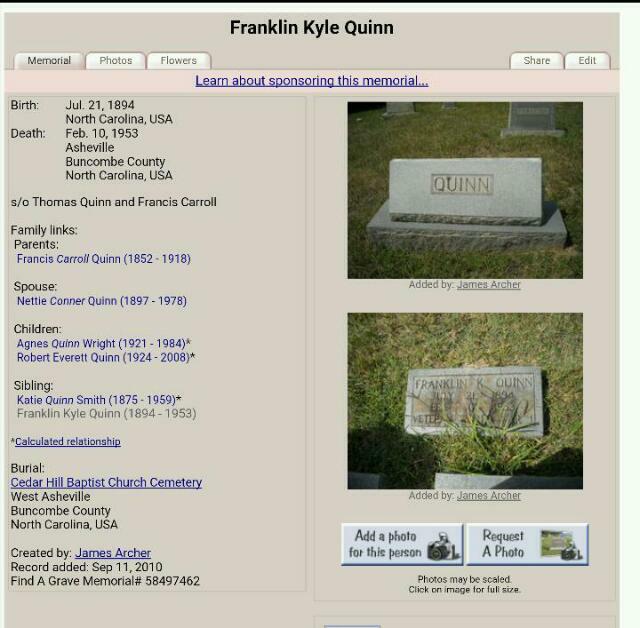 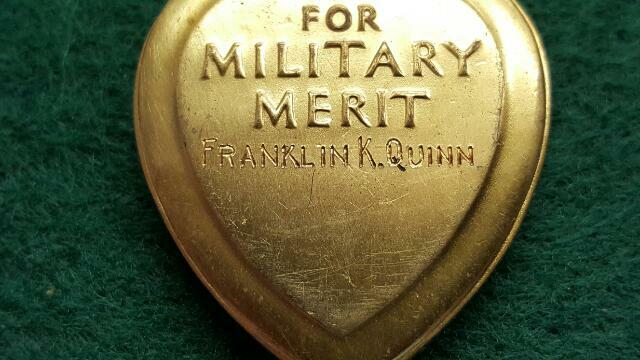 Franklin K Quinn was native born in Buncombe Co.Asheville area, North Carolina. 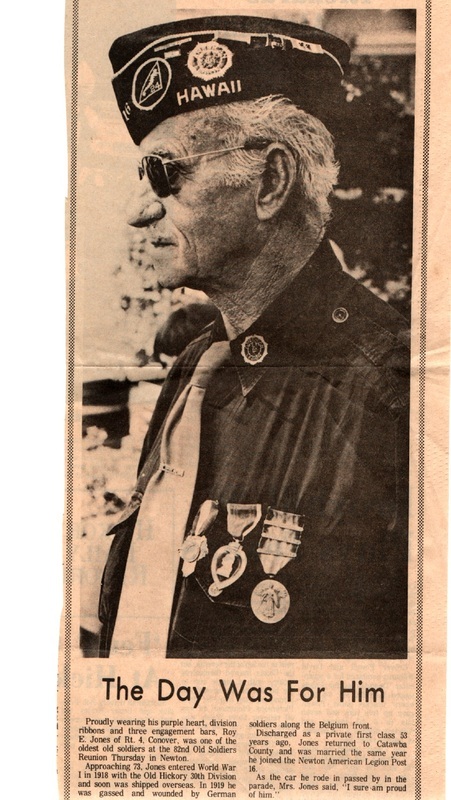 He served as a Pvt.in Truck Co No 2, 1st Coastal Artillery, he finished out the War being awarded the Purple Heart and a five bar Victory medal, Quinn had a busy time "Over There". 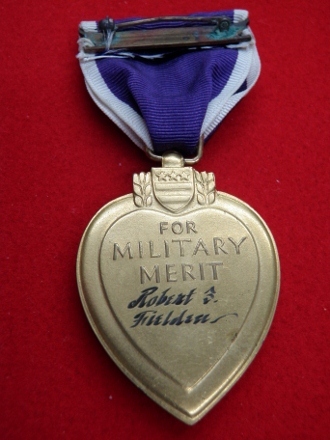 The President of the United States of America, authorized by Act of Congress, July 9, 1918, takes pleasure in presenting the Distinguished Service Cross to First Lieutenant (Infantry) Zebulon B. Thornburg, United States Army, for extraordinary heroism in action while serving with 118th Infantry Regiment, 30th Division, A.E.F., near Montbrehain, France, October 8 - 16, 1918. 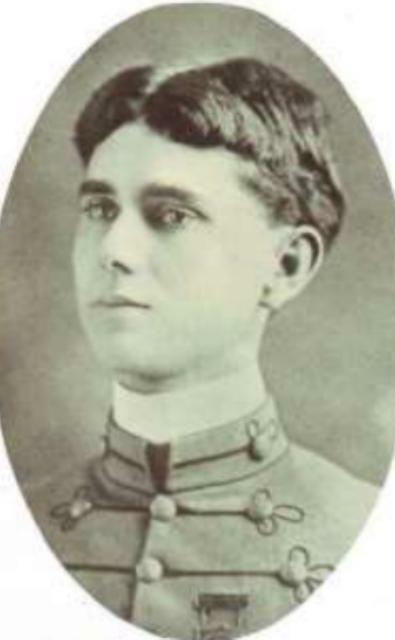 Although he was severely wounded on October 8 to such an extent that eating was impossible, First Lieutenant Thornburg remained as second in command until the night of 16 October when he was again wounded during an advance by his company. 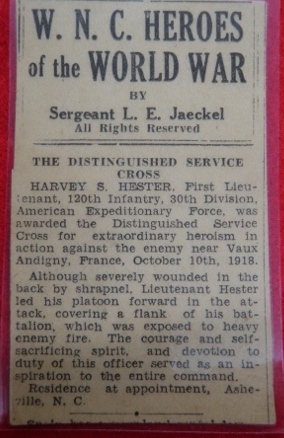 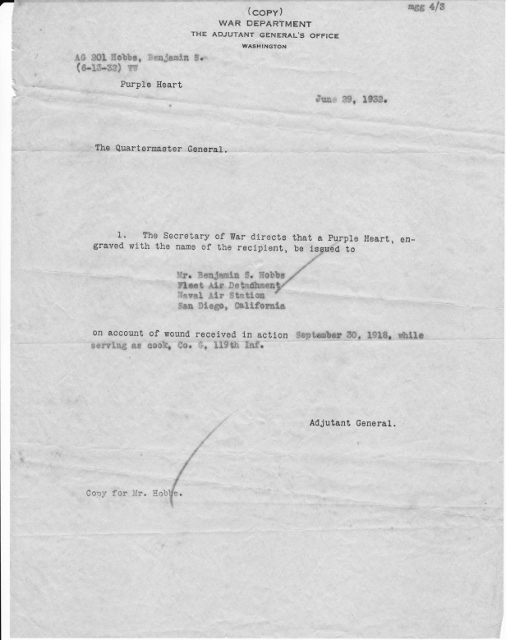 The President of the United States of America, authorized by Act of Congress, July 9, 1918, takes pleasure in presenting the Distinguished Service Cross to First Lieutenant (Infantry) Guy L. Hartman, United States Army, for extraordinary heroism in action while serving with 6th Infantry Regiment, 5th Division, A.E.F., near Frapelle, France, 17 August 1918. 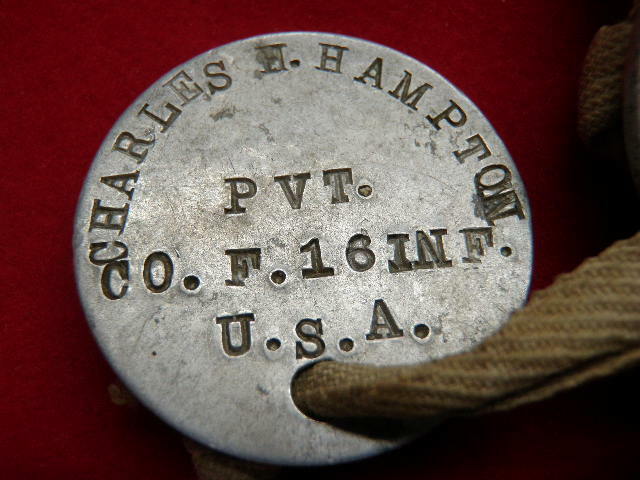 After having been painfully wounded Lieutenant Hartman refused to go to the rear for treatment. 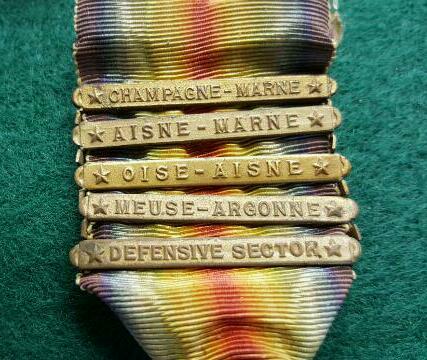 He made his way through a heavy barrage, and brought up a platoon that was stopped by heavy fire. 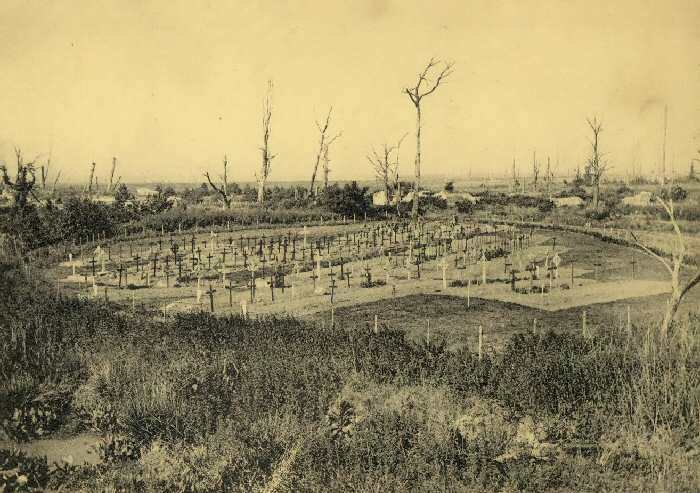 Some time later, after having his wound dressed he conducted his brigade commander through a heavily gassed area, after which he remained constantly on duty until relieved. 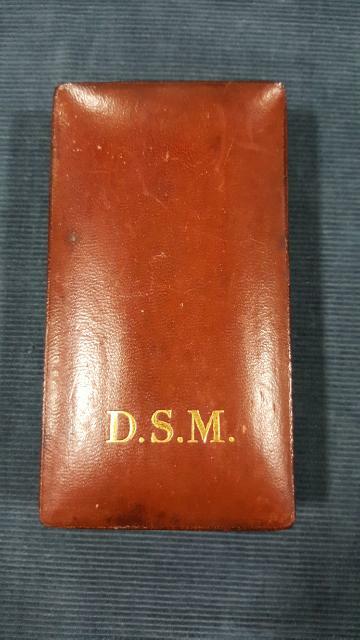 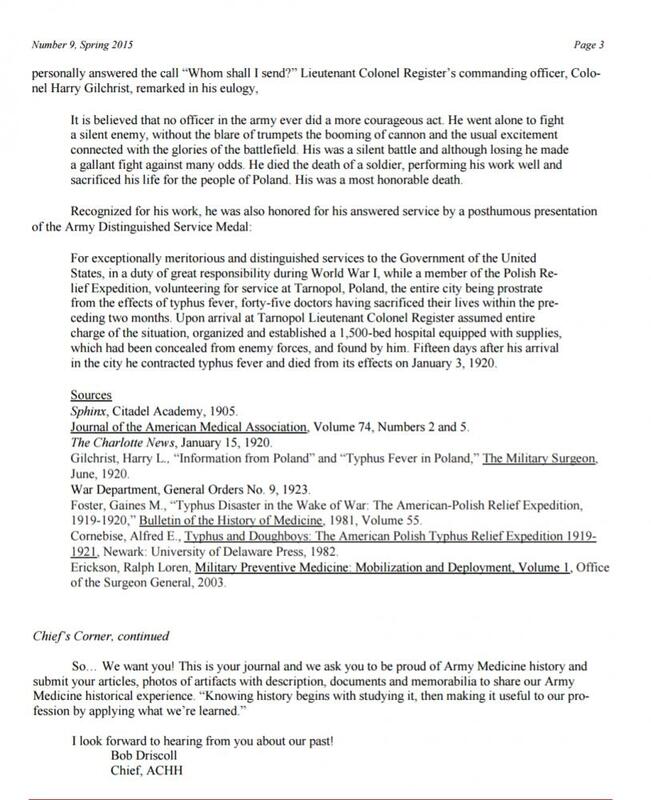 Posthumous DSM to Lt.Col. 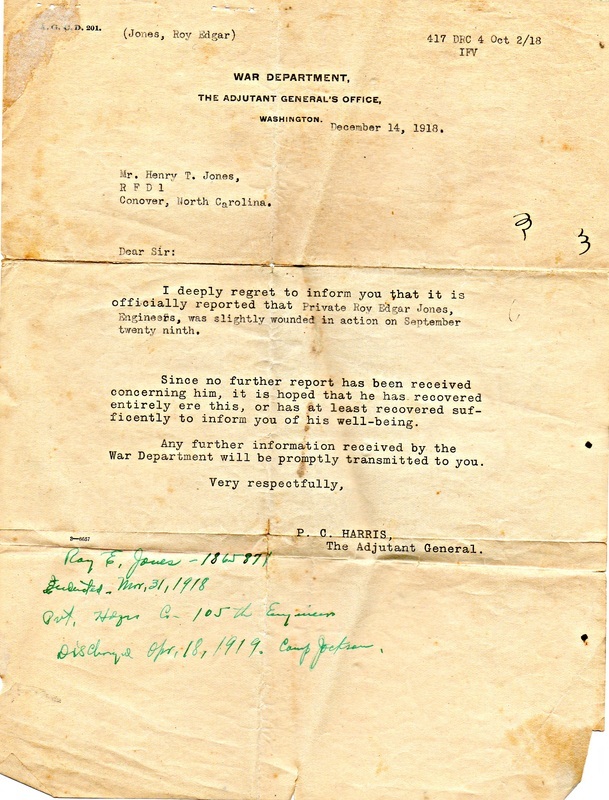 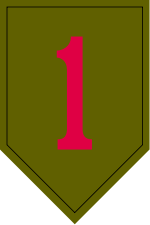 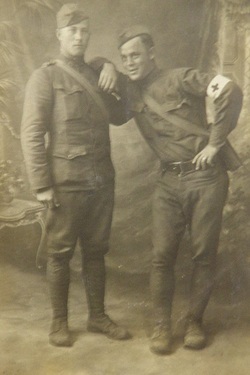 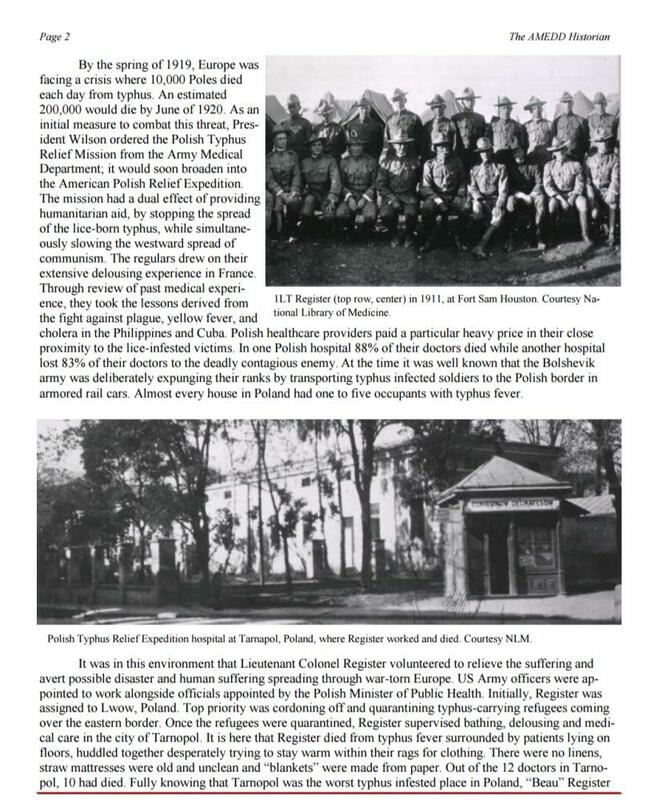 Edward "Beau" Chauncey Register who died in service trying help combat the Typhus epidemic in Poland.This was one of the 17 awarded DSM's inter-wars.Beau was from Rose Hill, North Carolina.